Sleep apnea, a disorder characterized by abnormal pauses in breathing during sleep, affects millions of people worldwide. It can be a scary experience for the sufferer, but since it often causes very loud snoring it can be an incredibly disturbing experience for others in the household as well. 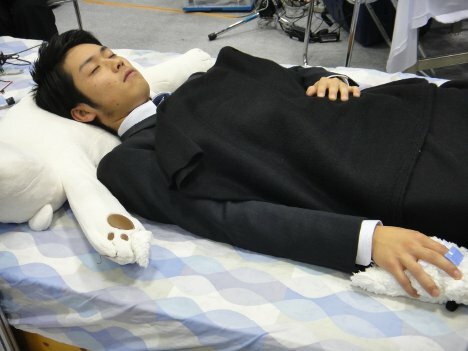 The Kabe Group at Waseda University are developing a “robotic pillow” to help ease the symptoms of sleep apnea sufferers. The pillow is actually more like a big, soft teddy bear with moving arms. 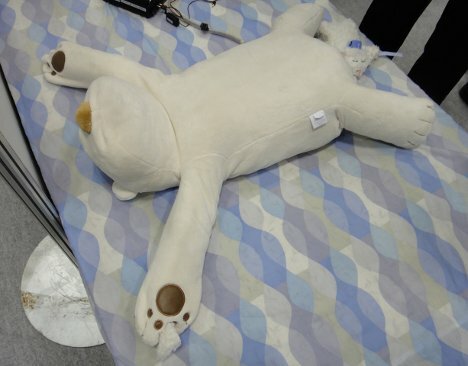 The bear’s body is a pillow and its robotic arms reach out to gently nudge the sleeper onto his side when his breathing is interrupted or his snoring becomes bothersome. The system operates with a pulse oxymeter, a small device worn on the finger to measure oxygen concentration in the blood. When the wearer’s blood oxygen dips and it is apparent that he has stopped breathing, the pillow’s actuators go into action. The pillow can either cause the sleeper to roll over onto his side or wake him up entirely, depending on the severity of the breathing interruption. While the concept seems to be a beneficial one that could help a lot of people, we have to wonder why it’s got to be so cutesy. 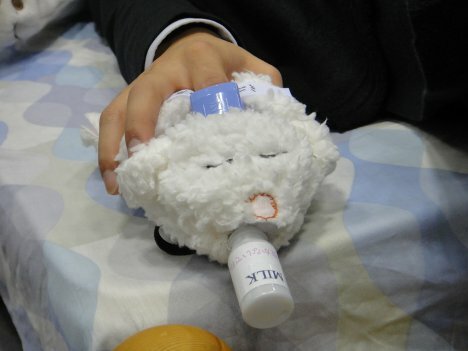 The sleeping bear pillow with its sweet little face is complemented by the pulse oxymeter, which happens to be in the shape of a furry sheep with a bottle of milk in its mouth. Since sleep apnea affects more men than women, we’ve got to assume that the Kabe Group is just trying to humiliate those men into getting over their snoring problem.